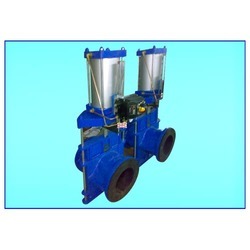 Supplier & Manufacturer of Pneumatic Pinch Valve. Our product range also comprises of Polypropylene Chemical Process Pump, Pinch Valve and Centrifugal Chemical Process Pump. We offer a wide range of Pneumatic Pinch Valve. Pneumatically actuated pinch valves are reasonable flow control solution for most demanding applications. After having much experience in manufacturing manual wheel operated Pinch valves, we have also been successfully manufacturing and supplying Pneumatic Pinch Valve. These automatic pinch valves are fitted with pneumatic accessories of well-known brands to ensure trouble-free long life and customer service back up as we provide for our pinch valves. The flow-through pneumatic pinch valve in a fully open position is full as that of a pipeline while ensuring leak tight shut-off in the closed position. Pneumatic cylinder operated pinch valves can be supplied as an on-off valve or throttling-control valve. We also manufacture chain or gear operated pinch valves, hydraulically actuated pinch valves and motorized electrically actuated pinch valves.